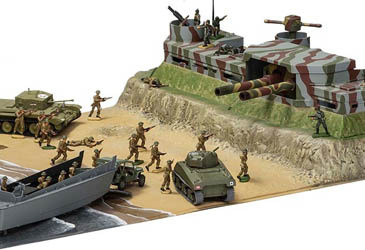 Airfix have a long and reasonably glorious history of making battlesets. From their point of view it was a relatively cheap way to make a new product, sometimes requiring no more than the design of some new packaging, but for many a small boy such sets were a wonderful if often unobtainably expensive toy which seemed to deliver an entire battle in one box. 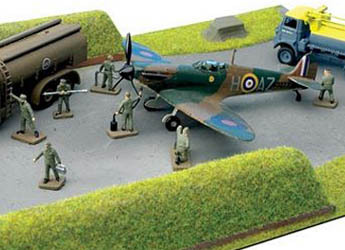 This article looks at the Airfix battleset in all its many forms, but naturally concentrates on the figures to be found in each. 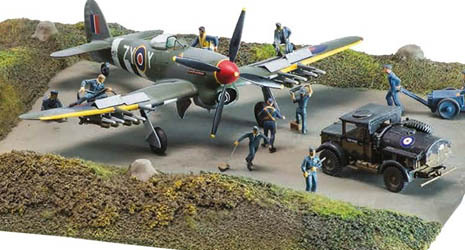 Many Airfix kits and diorama products also included one or more figures, details of which can be found in our Airfix Kit Figures feature. 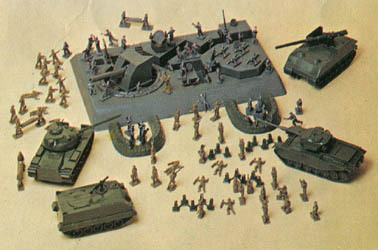 In addition Airfix figures were used in a number of battlesets from other producers, notably MPC and their Historama range, but these are not included in this article. 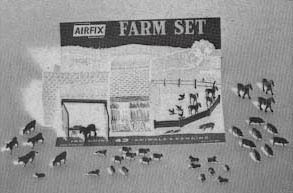 Early on in their history Airfix made a Farm Set (pictured above) which was basically a card farmhouse with a set of their Farm Stock. This was a perfectly good toy in its own right, and was probably also meant to work with their model railway products, but can hardly be described as a battleset. Nevertheless for the sake of completeness it does reference a set we have reviewed, so here it is. It does not appear in their first catalogue, produced in 1962, so perhaps pre-dates that, and the like would not appear again (although you could always choose to pair the animal set with the much later Waterloo farmhouse of course). Item 1661. 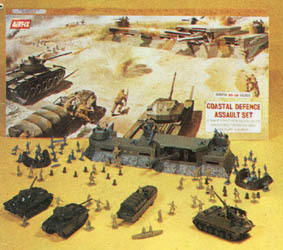 This was the first battle set to appear in an Airfix catalogue (the fourth edition - 1967). The above image comes from their fifth edition catalogue (which had better photography and was the first in colour). 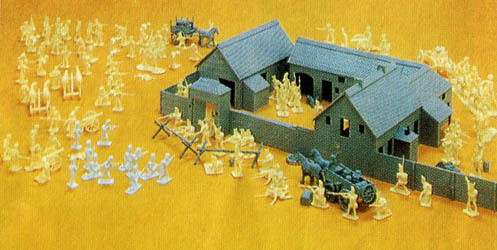 The set included one set each of first type US Marines and Japanese Infantry. It also included a number of their ready-made polythene vehicles and a vacu-formed base. 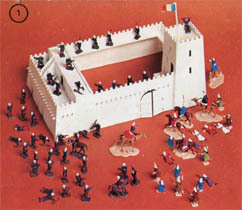 The set appeared in the fourth, fifth and sixth edition catalogues. Also known to exist, but apparently never appearing in any catalogue, was a similar set entitled 'Beach-Head Invasion Set'. 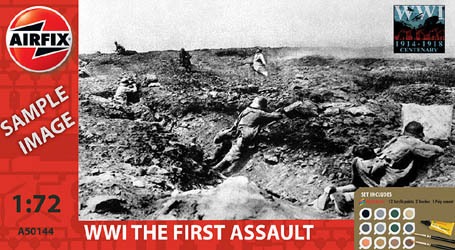 This was like the Attack Force set in that it contained several ready-made tanks etc., and a vacu-formed base which included the world's smallest harbour. Also part of the package were two sets of figures, and while we have never seen this product it appears the sets included were their Infantry Combat Group and first type German Infantry. These are two modern images of this product. 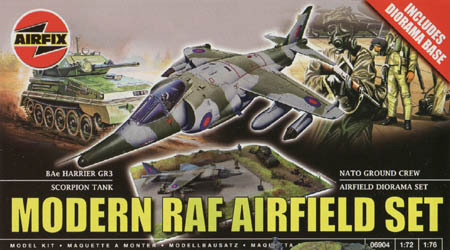 The first comes from the Airfix Collection forum at www.modelkitcollecting.com. The second is from Metropolis Vintage Toys, and we are grateful to them for permission to use it here. 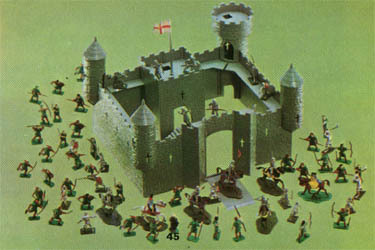 The 1960s also saw the first of the classic Airfix play sets hit the market. They were to cover much more than just World War II, and would provide a range of forts that would be much loved by a generation of children. Item 1650 or 09703-9. First appearing in the 1969 catalogue, but bizarrely actually dating from 1966, this product contained complete sets of Wagon Train, US Cavalry and Indians. 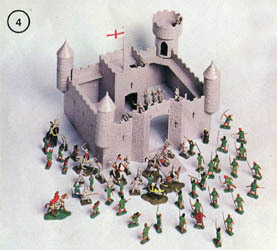 Just as importantly it also contained a really nice snap-together plastic fort, which was the first in a series of large accessories Airfix produced to greatly improve the play-ability of their figures. Lovely though it was, like most of the range it strays a long way from historical accuracy, though whether any child cared seems doubtful. 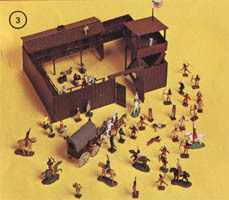 Of more interest is why Airfix chose the Wagon Train rather than the Cowboys set. 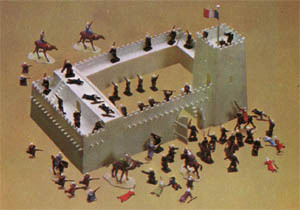 True neither would find themselves defending a fort from native attack, but in the absence of a set of Indian Wars infantry or dismounted cavalry Airfix had no other choices. The problem is the Wagon Train is full of people eating, strolling or riding the wagon. No-one is in the least concerned about the many Indian warriors swarming all round them at that moment, and certainly no one is using a weapon, so a very one-sided 'battle'. At least the cowboys are firing their weapons and looking active, so might have made a bit more sense! Note how both product photo and the description fail to mention the presence of the US cavalry figures. Although this set lasted longer in production than many others, it disappeared, along with the rest of the play sets range, in the 1980s. 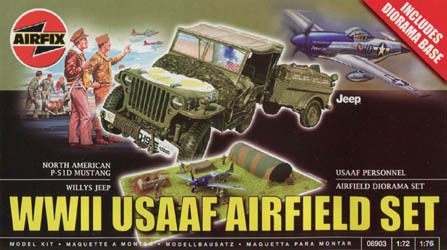 Then in their 1993 catalogue Airfix relaunched several, including this set, now coded as 06703 and renamed 'Fort Apache'. The contents were as before except that the Wagon Train was removed. Item 1684 or 09701-3. Also first produced in 1966, this contained complete sets of first type Foreign Legion and Arabs (Bedouins). Again the included fort is pretty small, with virtually no accommodation for the garrison, horses etc., but otherwise reasonably authentic and with lots of charm. The choice of Bedouin Arabs as opponents probably has more to do with images of Beau Geste than anything else, but the set has proved popular over the years, especially as Esci also made suitable figures. This set reappeared in 1993, by which time it used the second type legionnaires, and had the code 06701, but was otherwise the same as before. Item 1685 or 09702-6. Like both Wild West and Sahara, this set first appeared in the 1969 catalogue, but was actually released in 1967. 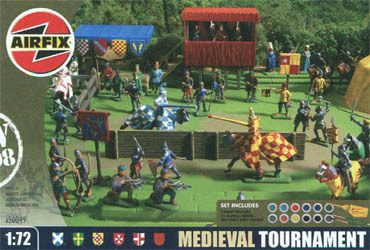 This one contained complete sets of the only medieval figure sets Airfix ever produced, namely their Robin Hood and Sheriff of Nottingham. Even given that Robin Hood is a mythical character it is hard to see how, and indeed why, he and his band of merry men would want to attack a castle, but we must not let that get in the way of playtime. The castle itself is again very small, mostly just curtain walls and not up to much in terms of actual history, though we have seen multiple sets combined to form something a bit more realistic. The problem of how to make a set that is half cavalry defend a castle under siege is resolved in the usual Airfix way, by having the defenders open the doors/drawbridge and come out to do battle; most obliging! In 1993 this set re-emerged with code 06702 and now called 'Robin Hood'. The contents were the same as before. Item 1686 or 09704-2. 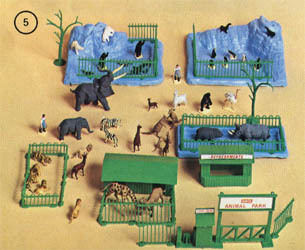 1970, and the seventh edition of the catalogue, brought us this, very non-military Zoo set. Again, far from a battleset, this was a collection of new enclosures and fencing pieces plus an entrance with turnstile and a refreshment bar. As can be seen, it included both Zoo Animals No. 1 and Zoo Animals No. 2, providing a fairly good range of the more traditional animals you might expect to see in a zoo in the late 1960s. Our modern attitude to animal welfare makes zoos somewhat controversial for many, but of more immediate concern is the obvious lack of space for everything, meaning the paying public have to share their space with numerous other species, including lions and elephants. Item 1720 or 09705-5. 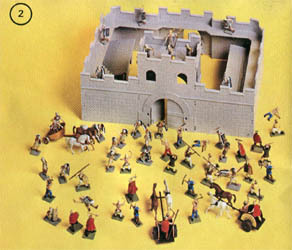 This was the one and only ancient set Airfix ever made, named Caesar's Gate (1969). Clearly it was based on the milecastles found on some Roman defensive walls such as Hadrian's Wall in Britain, and is actually a pretty good model of one, being about the right size too as only a handful of men would stay in one. Naturally the set came with the two Airfix sets of Romans and Ancient Britons. 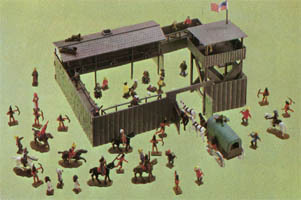 The set appeared once more after many years in 1993, when it was given the code 06705 and was renamed 'Roman Fort'. Contents were unchanged however. Item 1743 or 09706-8. 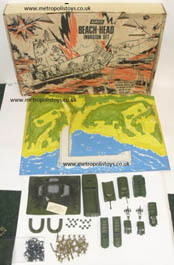 The Gun Emplacement model made an appearance during 1969 with this play set, and in the catalogue the following year. This one followed the normal play set format of a large accessory plus two sets of figures, in this case the Paratroops (later renamed British Paratroops) and yet again the first type German Infantry. 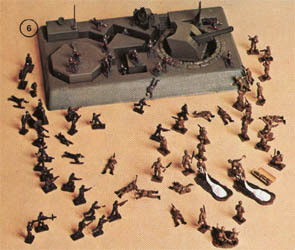 In the mid 1990s the set reappeared as simply 'Gun Emplacement', with the paras facing the second type German Infantry. 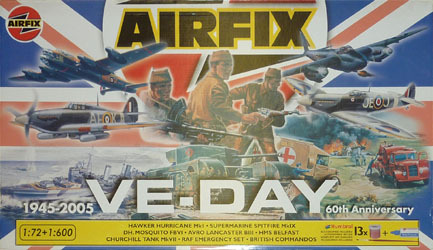 Although Airfix had produced an assault set early on in their history, the name would later be used to define a series of larger play sets which included a large main accessory, two or more sets of figures and some vehicles. Item 1721 or 51650-7. 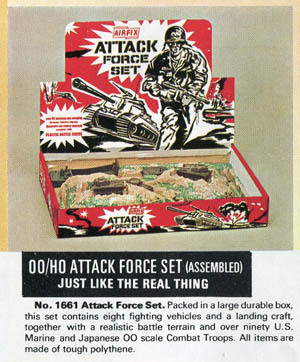 The original Assault Set mentioned above disappeared from the catalogue when this new set arrived in 1970. Now however the action switches from the Pacific to Europe as the figures are the Infantry Combat Group and first type German Infantry. This was still a large set as you also got the new gun emplacement, four tanks and vehicles plus a few accessories to play with. 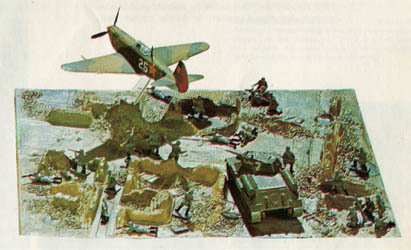 In later catalogues Airfix would rename this product as 'Gun Emplacement Assault Set', once other assault sets were made. 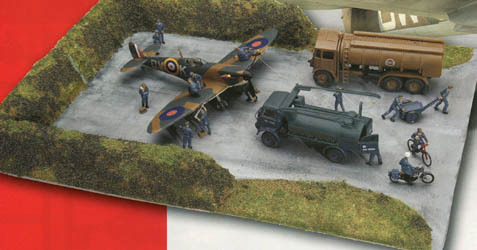 Notice that the first image above, taken from the seventh Airfix catalogue, was printed reversed for some reason. Item 1765 or 51651-0. 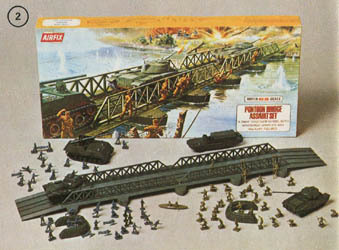 New for late 1970 or possibly 1971 was the pontoon bridge model, and a new assault set to accompany it. Like its predecessor, this product provided more in the way of extras than just the bridge. We have the bridge itself, four vehicles and some sandbags and tank traps, with the obligatory two sets of figures, this time it is our old friends the first type German Infantry facing the British Commandos. Item 1693 or 51652-3. The ninth edition of the catalogue, produced in 1972, brought us this set, the latest of the larger assault sets. Once again a new accessory - the coastal defence - was served up with the usual accessories and two sets of figures - British Commandos and those very hard-working first type German Infantry. Item 51653-6. 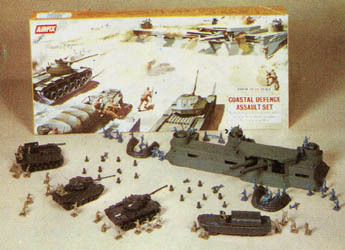 The eleventh, 1974 edition of the catalogue revealed this set, the first assault set not for World War II. 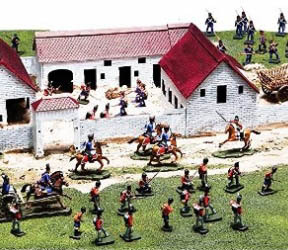 By now Airfix had a decent range of Waterloo figures, though still no Prussians, and the farmhouse model had appeared the previous year. 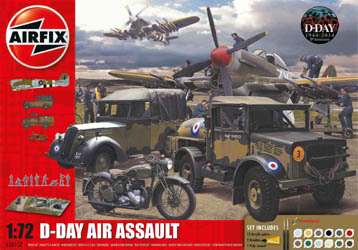 The above product photo includes the prototypes of the accessories that were to be made especially for this set, but in the end the actual accessories would be very different (see Airfix Waterloo Accessories for the actual product), although this photo was used on both packaging and catalogue for several years after. 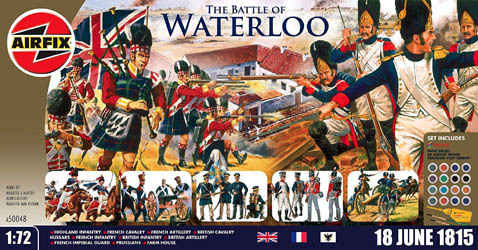 No prizes for guessing that the set included sets of Waterloo French Infantry, Waterloo French Imperial Guard, Waterloo French Cavalry (Cuirassiers), Waterloo French Artillery, Waterloo British Infantry, Waterloo Highland Infantry, Waterloo British Cavalry (Hussars) and Waterloo British Artillery. Note the product shot has no cavalry in it - perhaps the decision to include cavalry was only made later. The original packaging is copyright 1975, so the set probably actually made its debut in that year. 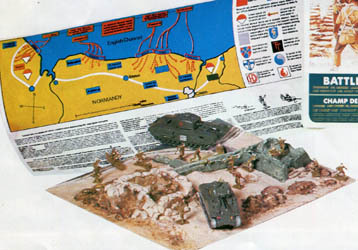 1973 saw no new play sets reach the market (though the new Waterloo Farmhouse promised good things for the future), but Airfix did launch the first of the new series entitled 'Battlefront History'. These differed in that each concentrated on just one side of a specific, named battle, though they were always released in pairs so you could put them together to get your battle. 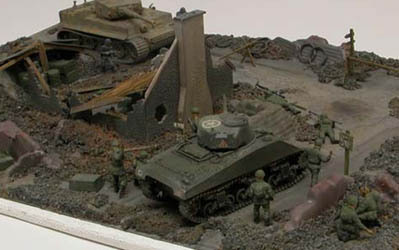 Each set basically contained a set of figures, two kits of tanks, vehicles etc. (i.e. 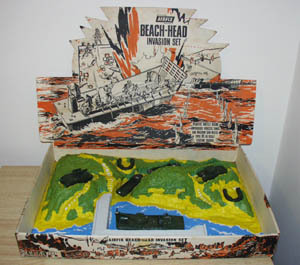 not the ready-made polythene 'Attack Force' used in the assault sets), a vacu-formed base, a colourful diagram and text on the battle, and a few paints and brush. Item 09651-9. This is the first of the new series, first visible in the tenth edition catalogue of 1973. 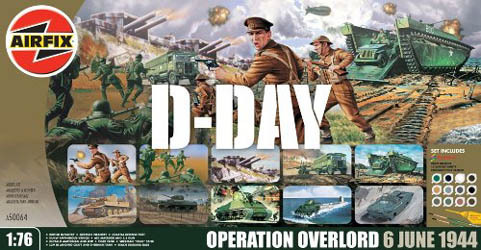 The kits were of the Sherman and Churchill tanks, and the figures were the British Commandos. Item 09652-2. This is the 'pair' for the above set, appearing at the same time. The kits were of the 75mm Assault Gun and the Panther Tank, and the figures were, once more, the first type German Infantry. Item 09653-5. 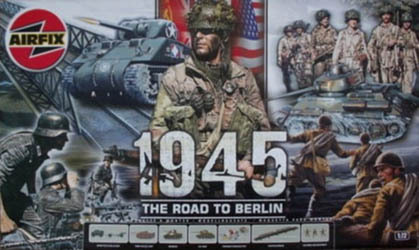 Released the same year as the D-Day set, this contained kits of the Lee/Grant Tank and 25 Pdr Gun and Limber, plus of course the first type 8th Army figures. Item 09654-8. The other North African set, this included the Armoured Car 234 and Tiger Tank kits along with the first type Afrika Korps. Item 09655-1. Appearing in 1974 along with the following three sets, this contained kits of the Panzer IV tank and ME-109 fighter along with German Infantry figures, which by this date were probably the second type. Item 09656-4. Facing the Germans at Stalingrad, and arguable more of an attack force than them as the battle went on, this first Soviet set held kits of the T-34 tank and YAK-9D fighter, as well as the expected Russian Infantry. Item 09657-7. In some ways this brought Airfix full circle as it is fairly close to their original Attack Force set, concentrating on the Pacific War. 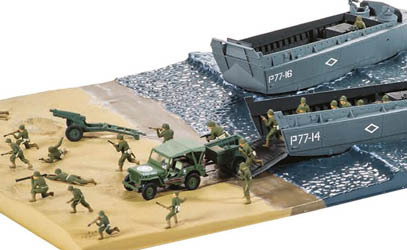 The kits of the LVT amphibious landing craft and Wildcat fighter are joined by the first type US Marines. Item 09658-0. This was the last set ever made in this short series. 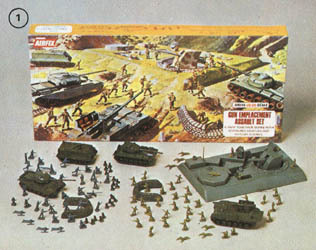 Perhaps customers wanted full battles rather than just one side, but whatever the reason Airfix did not add to the series after this one, which contained kits of a Chi-Ha tank and a Zero fighter as well as a set of Japanese Infantry. Item 10300G. 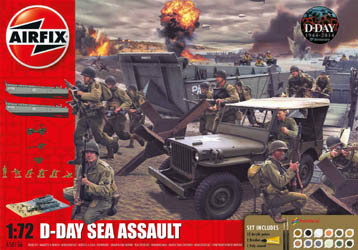 Naturally released in 2004, this set, one of many to bear the 'D-Day' label, included numerous kits of tanks, vehicles, aircraft, the Coastal Defence Fort, plus full sets of German Infantry, German Paratroops, US Marines and US Paratroops. Item 10301G. 2005 saw this set appear, which was a quite eclectic collection of components apparently selected to recognise as many branches of the British armed forces as possible. Thus we got the Hawker Hurricane, Supermarine Spitfire, de Havilland Mosquito and Avro Lancaster plus, strangely, the RAF Emergency Set for the air force, HMS Belfast (not in 1/72 scale but 1/600) for the navy, and a Churchill tank and the Commandos for the army. Again, this set only lasted the one year. Item 12301. 2005 also witnessed the release of this product, clearly jumping on the remains of the 60th anniversaries. Another well-stocked box, this one contained 25 pdr Gun and Tractor, 75mm Assault Gun, Sherman Tank, T34 Tank, Forward Command Post, Pontoon Bridge and, to underline the East and West theme of the set, full sets of German Infantry, Russian Infantry, British Paratroops and US Paratroops. Item 08662. 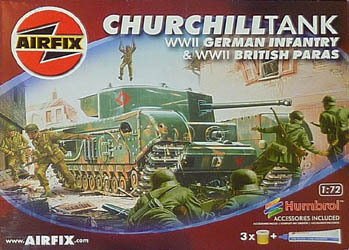 Also appearing in 2005 is this little-known set, which has no more than a kit of the Churchill Tank along with sets of British Paratroops and German Infantry. 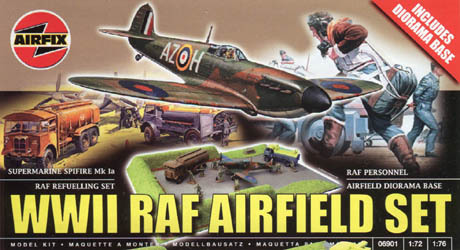 In 2007 Airfix were purchased by Hornby and revitalised, and around the same time they released some new airfield sets. Item 06901. This set contained a Supermarine Spitfire, RAF Refuelling Set, R.A.F. Personnel figure set and a diorama base. 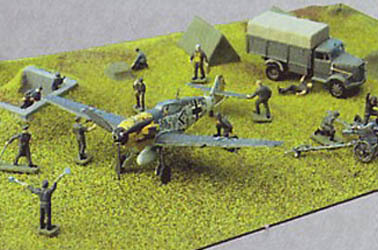 The product photo is taken from the catalogue, but notice the photographer has actually used German personnel to service the spitfire! Item 06902. 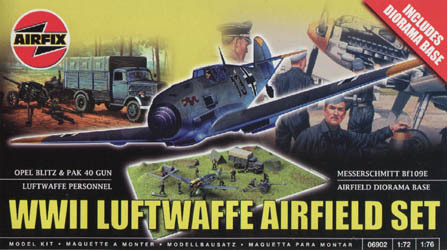 This set contained a Messerschmitt Bf109E kit, an Open Blitz & PaK 40, the Luftwaffe Personnel figure set and a diorama base. This time the photographer has called on the services of the USAAF to attend to the ME 109 - clearly not good at reading box labels! Item 06903. 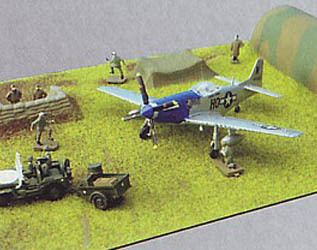 This set contained a P-51D Mustang, a Willys Jeep, USAF Personnel and a diorama base. By now the photographer has given up, totally confused, and has used US personnel here but added German pilots! Item 06904. 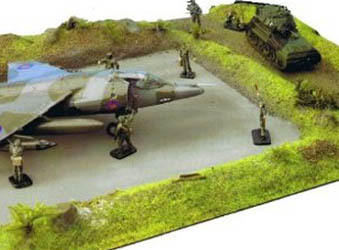 This set contained a BAe Harrier GR3, a Scorpion Tank, NATO Ground Crew and a diorama base. Horray - at last the photographer has got one right. The figures shown on the box are indeed what you get inside! 2008 saw the release of the first Gift Sets, generally combining multiple kits and/or figures to commemorate a particular event, or simply to provide a play set in the old-fashioned sense. The following such sets were produced. Item A50048. 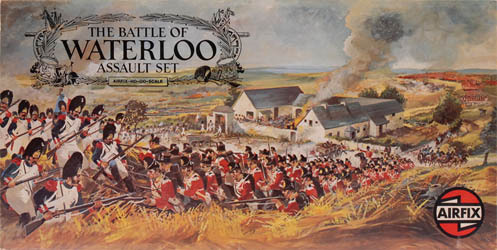 Similar but improved version of the old Waterloo Assault Set, this large box contained all nine of the Airfix Napoleonic figure sets (Waterloo French Infantry, Waterloo French Imperial Guard, Waterloo French Cavalry (Cuirassiers), Waterloo French Artillery, Waterloo British Infantry, Waterloo Highland Infantry, Waterloo British Cavalry (Hussars), Waterloo British Artillery and Prussian Infantry 1815), plus the original accessories pack and the farmhouse kit (plus paints and brushes). Some amusing schoolboy errors on the packaging don't detract from an impressive set, which also proved that the accessories pack had not been lost. Item A50049. 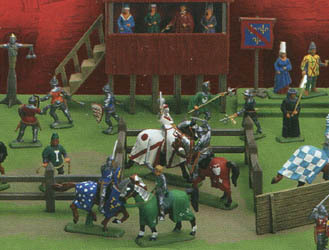 This set was a combination of the Italeri medieval playsets described here, so it included their French Knights and Foot Soldiers and English Knights and Archers figure sets, as well as paints, brushes and some vacu-formed tents and base. Despite some faults this is a really attractive set, but for whatever reason it was never actually released, and so disappeared by the 2009 catalogue. Item A50064. Another large set, with many kits of various vehicles etc. and a vacu-formed base. Just three sets of figures here, being British Infantry (the Esci version), Commandos and German Infantry. Item A50060. 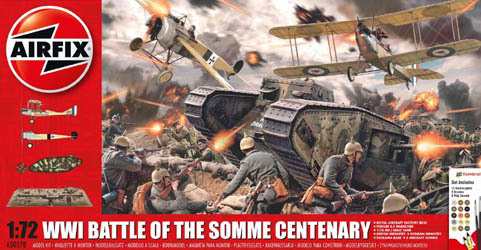 2009 saw the announcement of another large set, this time for the First World War. 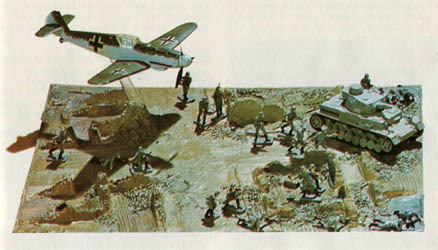 Airfix were not always particularly choosy about the historical accuracy of their play sets, and this one was a notable offender, if anyone cared. On offer here were figure sets of British Infantry and German Infantry - plus two British tank kits, base and paints etc. The main problem was the British and German figures did not match the presence of tanks - both are rather too early for the Somme, and certainly for Cambrai, when tanks were first used in large numbers. The French Infantry would have been for the right period, but they were left out, presumably because Airfix have never made any WWI French Tanks. The 2010 catalogue also hailed this set as 'New for 2010', so it may well be that 2010 saw the actual release of the set. Item A50009. 2010 was the year of another new release - this time back to World War II. Assorted kits were accompanied by British Paratroops and German Infantry. 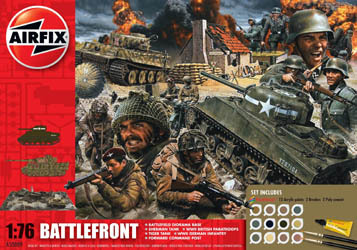 In 2014 this set was renamed as D-Day Battlefront Gift Set, but the contents were unchanged. Item A50015. Basically a repackaging of item 06901, with the same contents, but rebadged to take advantage of the 70th anniversary of the Battle of Britain.. Item A50165. 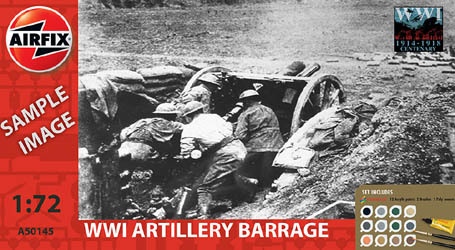 2014 was the centenary of the start of World War I, and Airfix had big plans to mark the anniversary over the following four years with a series of new products, including several new gift sets. 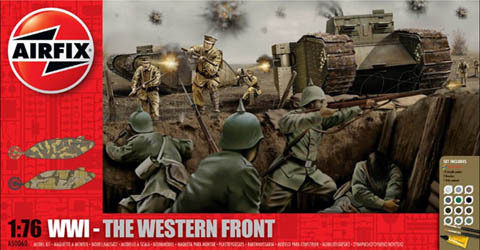 This was the first, which was basically to replace the previous Western Front set with something more realistic in that it would have the same early war British Infantry and German Infantry, but not the tanks. Problems elsewhere meant this set was cancelled and never appeared on the market. Item A50144. 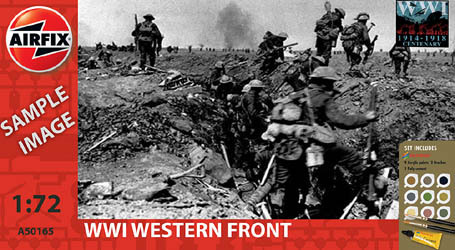 Another new World War I set which unfortunately also got cancelled after production problems. The contents were to be the old German Infantry along with a brand new set of early war French infantry. The process got as far as moulds being made and pre-production test shots produced, which looked good, but sadly production problems meant the set never happened, and this gift set too was cancelled before release. Item A50145. A third World War I battle set, and another that should have heralded some brand new kits and figures. This one was to have German, British and French artillery. Despite the existence of the very old Royal Horse Artillery, Airfix decided to retool the set, and add comparable German and French sets (the French having the famous '75 and the Germans the 1896 n/A 77mm of course). Sculpts and moulds were made of the French set, which included limber as well as guns and crew, but tragically problems in the process meant none of these sets were ever completed, and the battle set also never appeared. 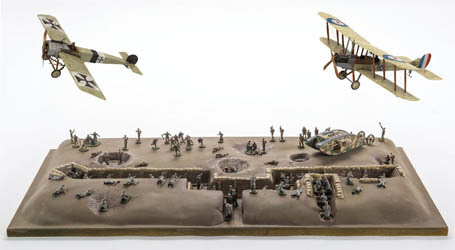 Airfix also had plans for other World War One figure sets and battle sets over the four year period, but with the problems of these three sets those plans were cancelled. Item A50156. Released to the World in 2014, the contents here were two landing craft kits, Willys Jeep and trailer, 75mm Airborne Pack Howitzer and one set of US Marines, referred to on the packaging as 'US Infantry'. Item A50157. This air-orientated gift set, also from 2014, contained kits for a Hawker Typhoon, Standard Tilly & BSA M20 motorcycle, Bedford MWC/MWD and a set of R.A.F. Personnel. Item A50162. 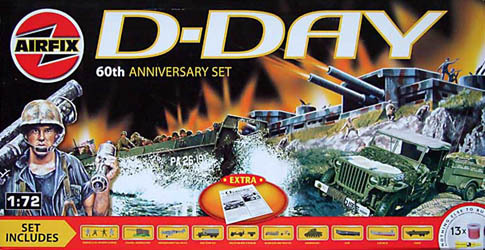 Another 2014 product to mark the 60th anniversary of D-Day, this particularly enormous one contained kits of Willys Jeep, Trailer and Howitzer, LCM Landing Craft, Higgins LCVP, Coastal Defence Fort, Sherman M4A2 Tank, Cromwell IV Tank, Bedford QLD Truck, plus sets of British Infantry (the new version) and German Infantry. Item A50178. 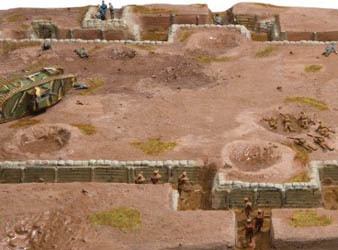 2016 saw another significant centenary - that of the Battle of the Somme, and to mark the event Airfix replaced their Western Front set with this one. Contents were a British tank and two aircraft, accompanied by the old sets of British Infantry and German Infantry. Not ideal for the Somme to be sure, but plans for later war versions of both sets had already been cancelled. As at the time of writing (2017), that is a complete list of the Airfix battlesets. 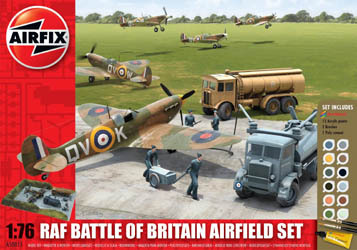 Airfix has its ups and downs, but has shown considerable enterprise over the years in repackaging its older kits and figures to make attractive battle sets that help to bring the hobby to a wider and younger audience, especially when they are focused on the idea of 'gift', perhaps jump-starting the interest of some young boy or girl in the hobby which we all enjoy. There seems every reason to believe that the future will see more of the same, mainly focused on World War II of course, but the ill-fated project to expand the World War One range in 2014, which would have included individual figure sets and gift sets covering particular battles such as Gallipoli and the Somme, holds out some hope that we may see new figures from this venerable but still very important producer in the future. Many of our readers may have gleefully received one or more of these big boxes over the past 50 years, and such products are surely a great way to get youngsters interested in the hobby and the history that it depicts. We look forward to another 50 years of imaginative and appealing products such as these.